Newsflash: In a shocking and ironic twist of fate, author Walter Greatshell was attacked by zombies during a party celebrating the release of his novel, Xombies: Apocalypticon. "He was in the middle of reading a chapter of his book, when suddenly these zombies appeared out of nowhere," said zombie fan Earl Yuntz, 19. "We saw these weird people clawing to get into the bookstore, and the next thing we knew they were inside. It was awesome." 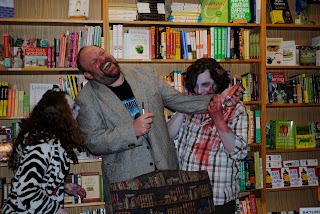 Greatshell survived an earlier zombie attack during a signing for his previous book, Xombies: Apocalypse Blues. When asked if he will continue writing zombie novels after this latest assault, Greatshell said only, "Aaaaaahrghllaaaaach." Brains ... I want to eat your brain . . .